UPDATED: Fri., May 4, 2018, 10:29 p.m.
OLYMPIA – Washington should use emergency funds to pay for postage on ballots voters mail in this year’s primary and general elections, the state’s top elections officer said. In a letter to Gov. Jay Inslee on Thursday, Secretary of State Kim Wyman urged the state to reimburse counties for up to $2 million for the prepaid postage cost of ballots returned by mail. The request was made in response to a proposal in King County to cover the cost of prepaid postage on its primary and general election ballots. If the King County Council agrees to do that, its voters would have “enhanced access” to the ballot box and voters in other counties could be confused about whether or not their postage is prepaid, Wyman wrote in a formal request for emergency funding. The council is scheduled to vote on the plan on Monday. King County has 30 percent of the state’s registered voters and has some legislative and congressional districts that include other counties. Some counties don’t have the money to pay for postage, she added. The Legislature has had several proposals in recent years for the state to cover the cost of postage for ballots, but none of those bills had the support to pass. The Legislature has, however, required counties to increase the number of available drop boxes – where voters can turn in ballots without having to pay postage. Tara Lee, a spokeswoman for Inslee, said the governor supports pre-paid postage for ballots and the staff is reviewing the request to see if there’s a way to pay for it. Wyman contends it’s an emergency because the counties must soon begin printing their envelopes for the primary and general elections. Under the state’s all-mail balloting system, voters can either mail back their ballot by putting a first-class stamp – currently 49 cents – on the return envelope, or by depositing the ballot in its envelope, without postage, in a drop box. Supporters of pre-paid postage for ballot return envelopes have argued that requiring voters to use their own postage reduces turnout. “We owe it to every citizen to help them reliably cast a vote,” King County Councilman Dave Upthegrove, the sponsor of the county proposal, said in an email. In an interview, Wyman said she’s never been opposed to having the state pay for postage. “I’ve always said it needs to be a statewide solution,” she said. 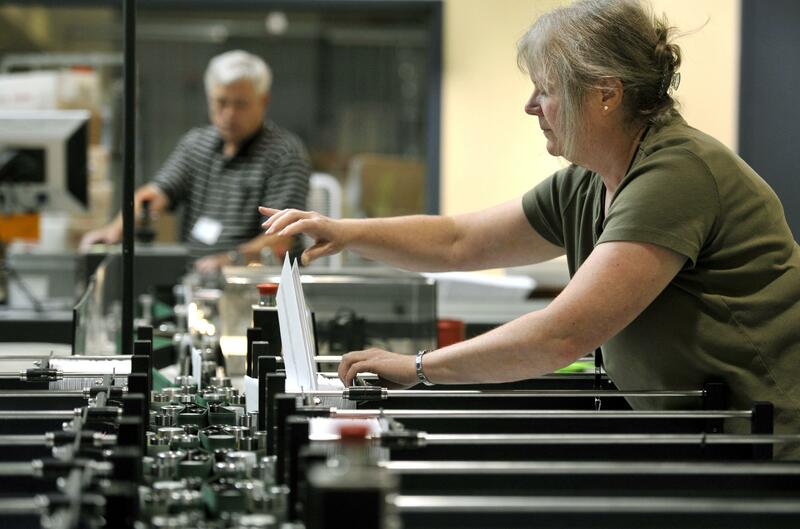 The cost of prepaid postage would depend on the number of ballots mailed back, Wyman said. For King County, it would be about 56 cents, but for some smaller counties it could be $1.25. It would be about 59 cents in Spokane County, which is not considering paying for ballot postage, Elections Manager Mike McLaughlin said. “We had a 6 1/2 percent budget cut. They don’t have the money to do that,” McLaughlin said. He’s not sure that prepaid postage would have a significant effect on turnout in Spokane County, where between 45 percent and 60 percent of voters use drop boxes, depending on the election. The special elections this February had higher turnout than last November’s general election in Spokane County, possibly because the more recent ballots had tax issues on them, he said. Published: May 4, 2018, midnight Updated: May 4, 2018, 10:29 p.m.